I was very impressed with your devotion to bringing philosophy out of the ivory towers of academia to share with and enrich the broader community. “Where’s my book?” asked sheepish adults, confessing that they were reading Little Big Minds: Sharing Philosophy with Kids for their personal enjoyment even though it was intended for grownups to use with children. “At last I can “do” philosophy,” they beamed. Now, at last…. Here’s your very own book! The glass half full that graces the cover of How Philosophy Can Save Your Lifecaptures the book’s heart. Mental vigor and clarity has the power to change how we view the world and our place in it. Our outlooks shift when we think as if for the first time about the meaning and the value of the ten key ideas. Priorities rearrange themselves naturally. Good conversations and quiet reflection reveal new insights as well as old knowledge somehow forgotten. What is good living? This book is an invitation to every reader to ask that question and to enjoy unraveling the answer, piece by piece, and to have fun along the way. While it can be enjoyed alone, it is designed for respectful conversation in communities of any number. Diverse contributions in dialogue resemble the colors of a prism, all shedding more light on the topic. Personal, private reflection is thereby more productive. Ah, the realization that there are so many stories, such varied ways of seeing a vast world that has room for all. We gather together and come to know each other better. The ten big ideas: simplicity, communication, perspective, flexibility, empathy, individuality, belonging, serenity, possibility, and joy. What do they mean, really mean? If we know better what communication is, then we will be better at it. If we think clearly about simplicity, we can indeed slow down and savor the moment. Understanding perspective enhances our own. Possibilities can be realized when we recognize them and learn to embrace opportunities. Thriving on a sense of belonging — while retaining individuality — can be achieved with new appreciation for what it means to belong and what it means to be true to one’s self. Empathy turns out to be smart. Flexibility comes more easily. Serenity and joy, regardless of circumstance, can be ours for the asking. Here’s how…. Each chapter explores one idea from many angles. First, the author presents the concept and probes for its center, explains its ongoing appeal in her philosophical circles, and paves the way for the investigation into simplicity, serenity, etc. Next, two philosophers are presented whose theories make perfect tools for close examination of possibility, empathy…. These philosophers range from ancient to modern, female to male, and represent a broad array of cultures: Plato and Jane Addams, Simone de Beauvoir and Shunryu Suzuki, Bertrand Russell and Mary Wollstonecraft, Martin Luther King and the Dalai Lama. Get ready because…. Things heat up now! Discussion questions are offered to spark your conversation. Are you an attentive listener? Does empathy come naturally to you? Is the pull of the crowd hard to resist? Have you forgotten reasons to be grateful? What part is yours to play in the world? Why had you given up on possibility? When does your heart fill? The party continues when …. You mix and match engaging ways to continue your exploration of the slowly unfolding concept. Music of all kinds awaits: Mozart and Pink Floyd, Johnny Cash and Miriam Makeba, Miles Davis and Edith Piaf, Cat Power and Bach…. Poetry beckons: Mary Oliver and Shakespeare, Rumi and Seamus Heaney, Rita Dove and Dylan Thomas, Gabriela Mistral and Thich Nhat Hanh…. Prose perhaps: Maya Angelou and Frank McCourt, Gandhi and Bobbie Ann Mason, Steve Martin and Toni Morison, Tove Jansson and Billie Jean King…. Popcorn and a film, documentary or drama, feet up: The Hobart Shakespeareans and Hamlet, Planet Earth and A Doll’s House, Death of a Salesman and Sierra Leone’s Refugee All Stars, Emmanuel’s Gift and The Night of the Iguana…. Finally, individual and group activities are suggested, maybe one for today and one to do as a group later. All the resources used are listed at the end of each chapter. to help individuals cultivate a meaningful or ‘good life’. There is no right way to use this book – plenty of ideas are offered in the introduction along with ways to start your philosophy group. Begin your evening with a movie or discussion questions if you like. Listen to music as you reflect on the concept under investigation perhaps. It’s your book now to adapt as you practice the art of clear thinking. If the reader gains as much insight and has as much fun as the author did in conversing and thinking through the ideas while writing this book, then philosophy will bring riches to your life. The glass can be more than half full. McCarty is a winner of the Nautilus Book Award. How Philosophy Can Save Your Life: 10 Ideas That Matter Most received the top honor in its category of Personal Growth/Psychology – the Gold Award. Signed and personalized copies are now available through Stone Soup Books. Contact us here with the details of your request. Books can be picked up in the Charlottesville/Waynesboro, VA area or shipped worldwide. For 40 years, our Counseling Department has sponsored a winter workshop that draws over 100 graduate students, school counselors, and regional mental health professionals. For the first 39 years, we invited regional and national experts in the counseling field. 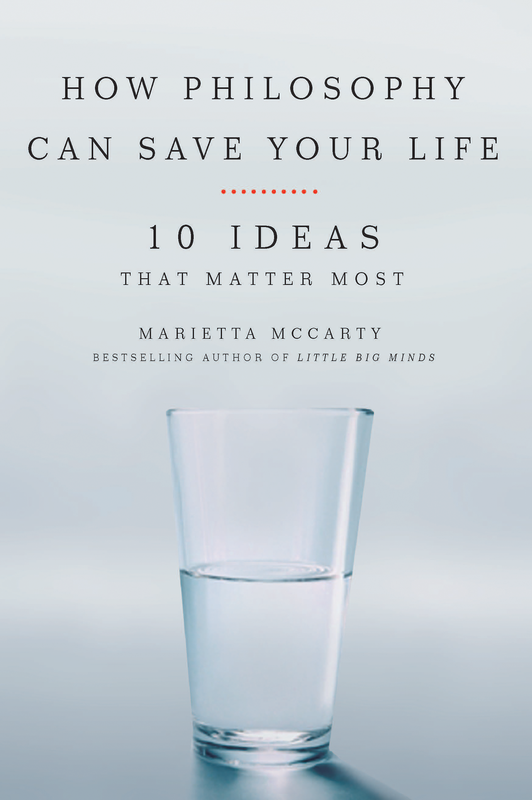 I was familiar with Marietta’s fabulous book, “How Philosophy Can Save Your Life: Ten Ideas that Matter Most” and suggested to the planning committee that we invite Marietta to share ideas from her book. During and after the workshop, so many people came up to us and thanked us for bringing Marietta McCarty to Cincinnati. “She was incredible. I can’t wait to read the book!” And other comments included “extraordinary,” “refreshing,” “stimulating,” “enjoyable,” “moving,” and “life-changing.” I can’t imagine an audience that would not find her words (spoken or read) thought-provoking, incredibly moving, and spot-on relevant! Why should it take great pain, suffering or tragedy in life to find the beauty and joy? Marietta … offered a new lens for all to find beauty, joy, happiness, and acknowledge our success in everyday life. Thank you to her for sharing ways to empty our minds of clutter to make room for true living—a life that is easier, happier and more fulfilled. I am living in the present and loving, with gratitude, every precious moment. Marietta opened our minds as well as our hearts. I find there are limitless exercises that I have begun utilizing with not only myself, but also as dialogue to encourage growth in my students and perhaps, most importantly to me, as a platform for my girlfriend and I to move beyond superficial levels of understanding and create opportunities for real/true/honest growth. Mahalo nui loa and I hope to at some point contribute thoughts and references to our social collective as elegantly as you have with this book. Thanks for sharing your wisdom and enthusiasm… As a therapist, I was struck by the many connections between your ideas and concepts we use in psychology…. the necessity of grounding any good counseling in a solid philosophical framework…. you sparked a lot of questions and insights for me that I will continue to pursue. What a delight! It brought back memories of taking my first philosophy course at Davidson College many years ago. The examples, grouping of themes and exercises were helpful. I hated for the book to end. As a practicing positive psychologist and college professor I often recommend books to students and clients. Yours will be one of them. ― David E. Mullen, Ph.D.
As a seasoned professional who has returned to graduate school to seek a second career in clinical mental health counseling, my heart is often filled with the joy of learning. However, the joy spilled over when Marietta shared a Miles Davis tune from his “Kind of Blue” album, during which the audience sat quietly, meditatively, contemplatively and wrote. It was a beautiful experience and another awakening to life’s great riches! I was thankful to be among the 100+ participants and thankful to have met such a spirited, humorous, good soul. It seems so simple sometimes, especially when it is articulated so wonderfully, to really know what brings happiness and peace. But people do get lost along the way. I think your book will give a lot of people the courage to make the changes they need to find a better way to live. What a gift to give the world! It was a good approach to writing about the good life in a common way. I am glad you are promoting philosophy in this way in a society that both somewhat disdains and needs philosophy. It was very practical, and I will have to put some of it into practice. Thank you for your wonderful book. For sure, the best book that I have personally read in many years… merci encore for sharing your thoughtful, kind and caring insights and ideas. You model the way of the good life by being the writer you are. This is the first book of yours I’ve read; it won’t be the last! By integrating so many aspects of the human experience into your work, you have shown the richness of a life well-lived. Anyone who reads this book should be ready for a great adventure! The book is one of those rare gems of thought and writing that are both accessible and SMART, distilling into conversational language what is often daunting within the pages of classical philosophy. Designed for both individual and group pondering, reading the short chapters brings focus to what truly matters, engaging heart, mind and imagination. In a a few, short weeks, I have found a “home” of beautiful minds who understand that joy comes from sharing what, indeed, matters most. You are one heck of a good writer and How Philosophy Can Save Your Life is filled with wisdom… This book is my “Bible” now. I stumbled across your book in my search for ‘self help’ books at the local library. I felt stuck in a rut and was trying to gain a different perspective on things in my life. Your book was not only a wonderful resource for an overall attitude shift but truly helped me see my circumstances in a different light. There is a line in the book Hurricane by James Hirsh that, sometimes you do not find a book, it finds you. Well… How Philosophy Can Save Your Life: 10 Ideas that Matter Most found me and I hope it continues to land on the laps of others looking for the wisdom, inspiration, and wealth of resources contained in it. Each chapter lifts you up with straight-forward simple truth presented in flowing prose laced with gems from ancient and modern philosophers. While all the chapters are great, ‘Empathy,’ touched me deeply, especially your words: "Acts of empathy lift our burdens, shining new light on lusterless days. Though we parade about in different bodies, we all know salty tears, anxious hearts, drained spirits, and weary footsteps. Empathy acknowledges this sameness; while it requires a leap out of my life and exposes me to your pain, empathy fine-tunes my heartstrings" (p. 134). This brilliant quote is a just a taste of the richness in the beautifully written treasure. Even though I graduated with a degree in architecture many years ago, my open electives during college were always focused on philosophy… I believe it was the basis for a life of critical thinking (and being!) combined with meaningful feeling. My mission now is to help transform the architectural profession to one that recaptures the essential history that it has created and extend the benefits of good design to us all. Like many of the topics in your book, I believe it is essential that we acknowledge the benefits that good design has on us, our environment, and our futures. Big thinking, like your book, is what we need. Your book sincerely spoke to me and my heart knows it as the truth. Wow, you really captured 10 ideas that can make our time here much better. Compliments for offering solutions to achieving the 10 ideas that the reader can take home with them. I am enjoying reading this book for its simplicity (in ideas and language) and it is written with complete sincerity and compassion. I would like to congratulate you for producing such a wonderful work that enlightens millions of souls who are stuck in the self-constructed prison of conspicuous consumerism. It is truly an enlightening to read your book! Just in the nick of time, before holiday hysteria could grab me, I received your new book How Philosophy Can Save Your Life. For starters, the opening chapter on the concept of ‘Simplicity’ may just have saved me from ‘holidaze’ 2009.
Who knew philosophy could be fun, accessible, poignant, illuminating, and helpful? In the past, boring, complex, and unattainable were some of the adjectives that came to mind whenever someone mentioned philosophy. That was before I read ‘How Philosophy Can Save Your Life’ by Marietta McCarty. Today, when I hear the word philosophy I think: curiosity, discovery, community, happiness…. ‘HPCSYL’ is an invitation to explore and celebrate valuable ideals. It is a cookbook of savory philosophy and thoughtful activities to help individuals cultivate a meaningful or ‘good life’. ‘HPCSYL’ walks the walk. It highlights the importance of community and belonging and becomes a great tool for connecting groups of people. Recently, we hosted a town-wide book group to discuss the first chapter of ‘HPCSYL’. Over thirty people gathered together at our local library to form one big philosophy circle. What a sight! Ultimately, we broke up into smaller circles and we will continue to meet biweekly, discussing each chapter’s topic. Local artists have jumped on board to show their ‘perspectives’ via their individual mediums. The ‘possibilities’ for enjoying this book and your own philosophical quest are endless. If your book club likes to talk about ideas more than plotlines, this optimistic and pragmatic how-to should be next on your list. In each of 10 chapters, McCarty explains a ‘big idea,’ such as Flexibility or Possibility, then offers discussion questions and meditative exercises (spend time with water to understand Serenity). The 4 philosophers she quotes and the artists whose works she urges you to sample are surprisingly diverse. Cat Power has as much to offer as Camus. McCarty’s enthusiasm for human achievement and potential is contagious. She encourages fun and sociable self- improvement-enlightenment for the yoga-averse. – Sonya Sobieski. Self-help always becomes even more fascinating when it’s backed by a little scholarship. In ‘How Philosophy Can Save Your Life: 10 Ideas That Matter Most,’ Marietta McCarty assistant professor of philosophy at Piedmont Virginia Community College and best-selling author of “Little Big Minds: Sharing Philosophy with Kids’ reveals how studying the greatest thinkers of our time can change your life for the better. McCarty divides her book into 10 chapters, each dealing with one of the big ideas she feels are necessary for a good life: simplicity, communication, perspective, flexibility, empathy, individuality, belonging, serenity, possibility, and joy. Full of personal anecdotes, each chapter explores the topic at hand with the help of two or more philosophers. For instance, when it comes to perspective, you can broaden yours by taking a tip from Mary Wollstonecraft, who saw past the mores of her society and refused to limit herself to conventional women’s roles. Instead of being wary of change, you can learn to be flexible, embracing the new and living in the now as Alan Watts advised. McCarty is spirited and funny, and she gives you help in implementing all you’re learning by providing thoughtful discussion questions, and even a little homework under amusing topic headlines like Listen and Hum, Recite and Write, Read and Talk, Watch and Reflect, and Get Up and Do. Want to find serenity in your life? Get out and garden. Need a new appreciation of joy? Go to a place ‘that makes your heart sing’ or listen to Vivaldi’s ‘The Four Seasons’ to reflect on how each season is musically exhilarating. Marietta makes her first trip to Cincinnati as the keynote speaker for the Xavier University Counseling Department's 40th Annual Winter Conference. Co-sponsored by the Greater Cincinnati Counseling Association, she joins a gathering of school and clinical counselors, educators, students, and Xavier alums, among others. Talk and discussion of How Philosophy Can Save Your Life followed by book signing at the Library of Virginia. MARIETTA regularly visits Fluvanna Correctional Center for Women to teach and engage in philosophical discussion. Marietta will be at Wintergreen for the day and into the evening on Saturday, November 5. The entire weekend is devoted to discussion and practice of the concept of Simplicity as detailed in How Philisophy Can Save Your Life. Her keynote luncheon speech will be followed by conversation, activities, art, and dinner.